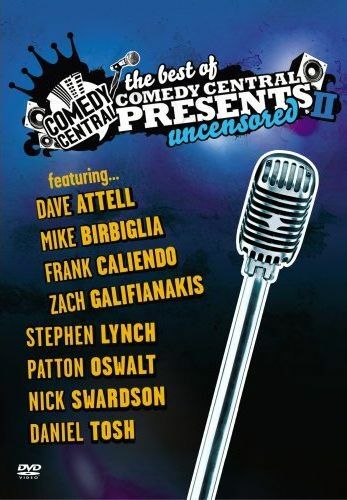 So The Best of Comedy Central Presents II Uncensored features eight comedians - Dave Attell, Mike Birbiglia, Frank Caliendo, Zach Galifianakis, Stephen Lynch, Patton Oswalt, Nick Swardson, and Daniel Tosh. Some are good, some are not so good, and some are hilarious. Dave Attell, the only guy on there I recognized other than Patton Oswalt, was just okay. Yeah there was some laughs, but not a ton, and there was he had nothing that was really memorable. Next was Mike Birbiglia. He was good, if not a bit odd. He had both my wife and I laughing out loud constantly. I don't remember the entire act, but I can still remember parts of the routine and they still make me laugh, so I'd say he was one of the better acts. After Mike was Frank Caliendo. This dude is a great impersonator. His favorite seemed to be John Madden, but he also took on Adam Sandler, President Bush, Scooby Doo & Shaggy, Chris Rock, Kacy Kacem, Robin Williams, Robert DiNero, Keanu Reeves, Rick Moranis, Jay Leno, Arnold Schwarzenegger, Mike Tyson, Fred Flintstone, Chris Farley, and Pauly Shore. His overall act was okay, it did make us laugh here and there, but it was really the impressions that made an impression on us... okay, that was unintentional. Moving on, Zach Galifianakis was up next. Now this guy was terrible! Oh man, his act was so dull. His attitude and demenor was very calm, and part way through his act he sits at a piano and starts playing this very calm very annoying repeating over and over again while he spouts off lame one-liners. SKIP IT! Four comics left to go. Up next is Stephen Lynch, whose act involves a lot of guitar playing. Actually, it's all guitar playing. Thankfully, his songs are pretty good, they both sound nice and are funny. They actually got me to go and check if he had any albums out... and he does! He's actually got a bunch. Hopefully their just as good as the ones he did for this show. And now we're at Patton Oswalt, who is hilarious, though his routine doesn't make you laugh constantly. It usually takes a moment or two for what he said to sink in, and by that time he's moved on, so you have like a smile or a smirk on your face for the whole set but don't actually laugh more than a handful of times. Down to the final two. Nick Swardson was fantastic, and quite memorable, especially with the giant blown up photo of him as a little kid blown up behind him, which he occasionally references. I think his routine was probably one of the best on the DVD, as we were constantly laughing. Daniel Tosh is the final stand-up comic to be seen here, and he's also pretty good. That guy has quite an imagination! The routine wasn't quite as good as Nick Swardson's, but it still made us laugh and thus ended the DVD on a high point. The extra features here aren't very impressive, but at least they're not terrible. Basically it's just some clips from other shows, like The Daily Show and Colbert Report. So overall it was a good watch, but I can't see owning it since you can find these episodes on television all the time. It's nice having them uncensored, but I don't think it'd be worth buying just to hear some swear words. Definitely a rental though, especially if you've never seem some of these comics.